Terry get a call from someone from her past. Des rings Daphne and begs her to come back. 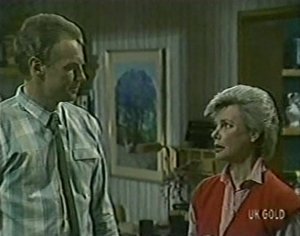 Des tries to tell Eileen about Daphne moving back in, but he can't get a word in. Eventually he tells her he'll be home late tonight so she shouldn't bother cooking dinner. Maria is cleaning and tells Helen she's nervous about tonight. She's upset that Danny won't support her in her relationship with Richard. Helen thinks Danny needs a clip round the ear! She suggests sending Danny over to the Robinsons tonight, so she, Maria, Jim and Richard can have dinner in peace. Des comes home from work to find Eileen has completely taken over in the kitchen. He raises his voice to get a word in and then tells Eileen that she can't move back in. Daphne is moving back in instead. 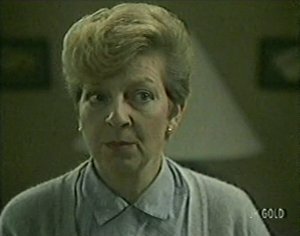 Eileen is upset, but Des points out that Eileen still has her unit and he can't let Daphne down. Eileen is not pleased but Des sticks to his guns. Paul tells Helen that Daphne is coming back to Ramsay Street - he's very pleased. 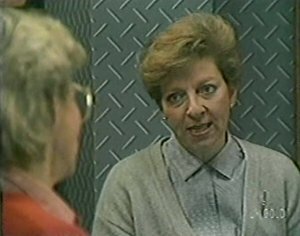 Eileen comes to talk to Helen, saying that Des is throwing her out. Helen tries to tell Eileen that she's got the opportunity to do what she wants now - she's sacrificed enough for Des. Eileen says all her friends are in Perth. Helen suggests she joins a social club or a bridge club. Eileen says she doesn't want to go out with men - they're only after one thing(!) But a platonic outing would be OK.
Just then Jim comes in and Eileen smiles sweetly at him, then takes her leave. Jim looks confused! Danny tells Maria that he doesn't know why she's going to such trouble for Richard. Maria tells him it'll be very successful without Danny around. Max rings Jim to ask him out for a beer to bury the hatchet. Jim has to tell him he's busy. Obviously he can't tell Max he's going round to have dinner with Maria and Richard, so he tells him he's doing his paperwork. Max slams the phone down and the whole apparatus falls off the wall! Helen tells Jim that he shouldn't have lied to Max - he could have just said he was going out to dinner. Danny comes round and tells Helen that Maria is running about half an hour later. Helen says that Scott is expecting Danny down at the Coffee Shop. Danny is clearly not pleased that Jim and Helen are going behind Max's back to have dinner with Maria and Richard. Eileen is sighing loudly as she packs up her things. Eileen tells Des that he can't cope with cooking for himself. But she thaws a bit and says she'll be round to do the garden. 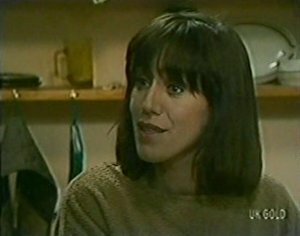 Eileen tells Des that she knows he has to live his own life. But she'll give Daphne some nutritious recipes to cook for Des! Jim is now feeling guilty about the dinner, but Helen and Paul say that there's nothing to feel guilty about. Jim says he'll definitely make up with Max tomorrow. Maria and Richard answer the door to Helen and Jim. 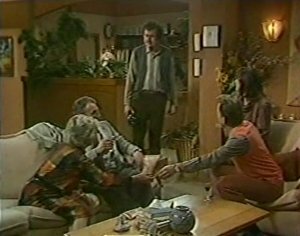 Maria introduces Richard and offers them all a drink. Jim and Richard talk about insurance and then the girls discuss Paul's wedding. Jim tells them that he lied to Max tonight. Danny comes round to see Max, who is trying to fix his bed. Danny invites Max down to the coffee shop, but he'd rather go round and see Jim. Only, Max doesn't want to interrupt Jim's paperwork. Danny doesn't say anything, but he does suggest that Max goes round to see Maria as she's "on her own tonight". 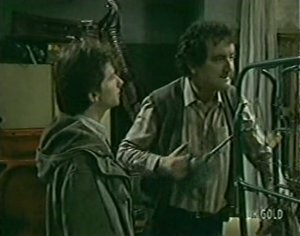 Also he tells Max that his bike needs an overhaul and Max agrees to go over to Ramsay Street after he's had his tea. 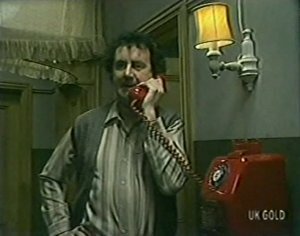 Danny goes to the payphone in the hall and calls Des. He asks Des if he can come over. Maria doesn't think things are going very well - Jim is being very inquisitive with Richard. But then Maria hears them laughing so apparently things have thawed. As they sit down to dinner, it turns out Richard knows Jim's business partner. Danny arrives and promptly goes to the window to spy on the Ramsay house. 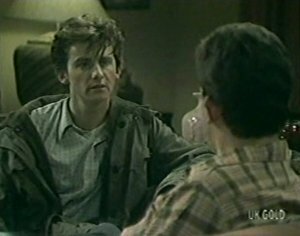 He tells Des about the situation with Jim lying to Max over Richard Morrison. Des says maybe Jim was just trying to spare Max's feelings. Des says that Danny shouldn't interfere in Maria and Richard's relationship - he has to accept that Max and Maria's marriage is over. 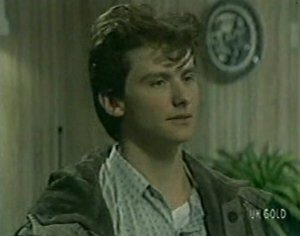 Danny says that if it wasn't for Richard Morrison, Max would come home. He'll help Max any way he can. The meal is finished and Helen and Jim sit down in the living room. Richard pours Jim a glass of port and they chat about Danny again. Jim says that Danny will have to get used to things. Richard says he's banking on patience and firm handling to win the day! Danny sees Max drive up in his car. Des calls Danny a "little ratbag". The atmosphere is very happy between Helen, Jim, Maria and Richard. Max comes in through the back door and sees at once what is going on.